Once again we were away by 8:40am and were glad. Nuneaton proved to be one of those towns we visited but doubt we would go back. The part of the town we visited looked dated and full of small houses in not the best of decor though to be fair we did not venture further into town. Our mooring was fine but at 10:30pm just as it was getting dark a loud banging on the saloon porthole and running feet shocked us to the bone. Clearly some lad playing knock up ginger. No harm done but it left a bad memory of the place. The rest of the night was peaceful enough but it was a relief to feel the water flowing under AmyJo's base plate again this morning none the less. The canal here is Oxtail soup coloured due to the local quarries used to discharge waste slurry into it. Now closed, considerable cargo was available from them when the coal needs were low. 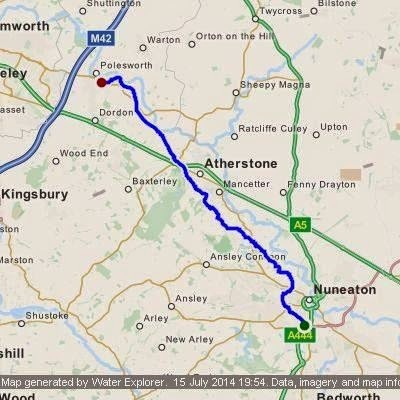 Onward towards Atherstone and round a tight turn we happen apon and old wharf with this old working boat. It looks like a Woolwich but I could be wrong. I read somewhere these are rare and its a shame to see this one in such poor condition though restoration looks does possible at first glance. A few more tight bends and the occasions narrows further and we are at Atherstone and its famous locks. 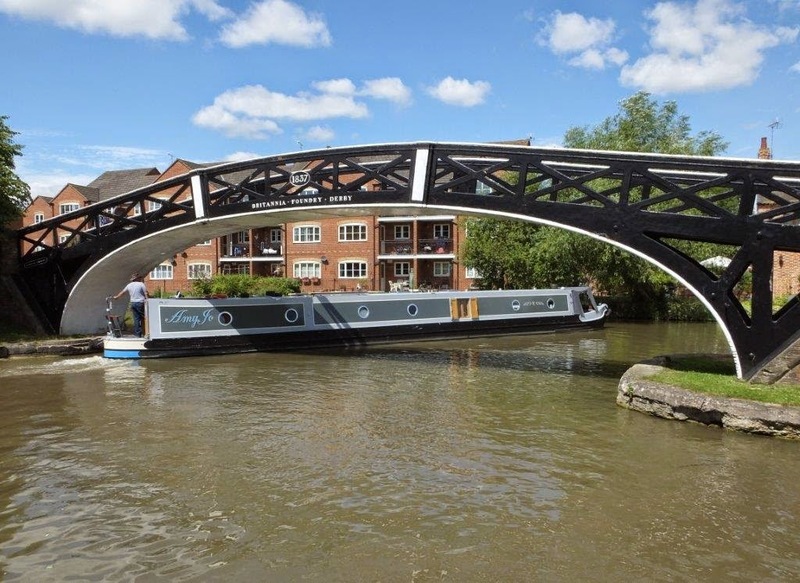 The Pearsons guide states " At 11 locks, the Atherstone flight is neither too long to over stay its welcome, nor too short to make an impression on your mind and muscles. Sums the flight up rather well I thought and it certainly left and impression on Chris all be it with a windlass handle. Explanation shortly. The locks look quite charming and the top levels are lovingly maintained in pristine condition by the volunteer lockies with not a blade of grass out of place, nor graffiti to be seen. A shame we could not stop and take more time but needs must. Head in the wall, a hidden stair well down to the water to jump aboard. 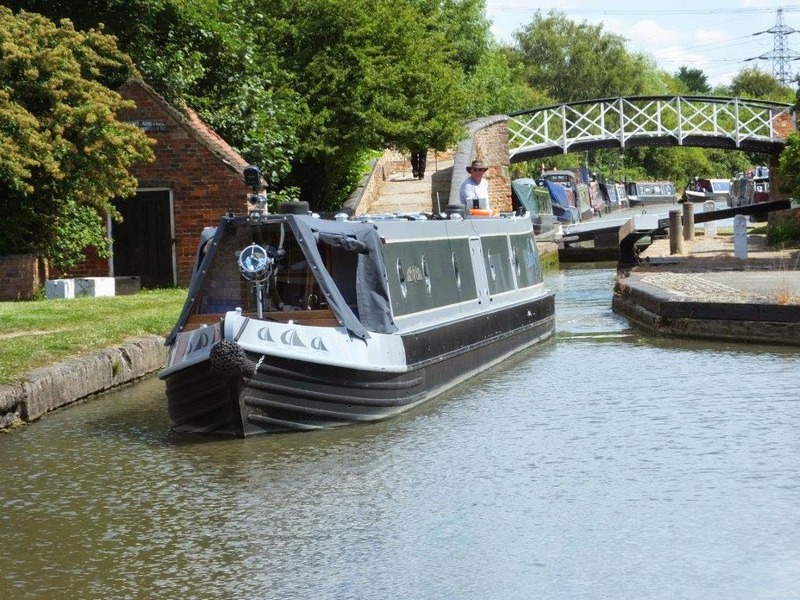 After the first five locks the pounds start to get longer as you leave Atherstone towards the country so to give the weary lock wheeler time to recover. The final two pairs 8 and 9 and 10 and 11 are over 900m apart. It was at lock 11 that the flight made its impression on Chris. Chris uses a long throw windlass to allow better purchase on the gears for her strength but at this lock the gears were slightly lower causing her hands to brush the beam. Just at the last very last turn of the paddle gear the beam caught her thumb and she lost her grip on the windlass. The windlass spun and the handle whacked Chris just above her mouth and below her nose. Lucky it was not lower or she certainly would have lost some teeth. Being a school first aider she immediately applied an ice pack and slowly the bleeding ceased although it was not pouring. She now sports a fat upper lip but she is so lucky no long term damage was done though eating is somewhat painful at the moment. Again, the Peason's guide reckons 2 hours is average passage time down the locks. As newbies we did it in 2.5 hours so are quite pleased with that and only 3 locks were not in our favour. We continued on our way and on passing Grendon Dock and its historic boats. As we are half a day ahead of our planned schedule we decided on a shorter cruise today knowing Atherstone had to be descended so at Polesworth we called it a day. We are now moored by a lovely large park area. After an hours snooze we wandered off into the village which is quite pleasant compared to Nuneaton. Walking though the park to the other side one comes to the village proper where numerous shops can be found including a well stocked Spar, whilst across the road is a small Aladdin's cave of a hardware shop. If you need anything from a broom to bolt to a stainless screw they have it but be warned, give yourself plenty of time to peruse their wares as you will need it to find what you want. no idea what species it is. Oh and I nearly forgot. Fiona from nb Epiphany sent us these great photos when we met at Hawkesbury. Thanks Fiona they are terrific. Ouch! Hope that there's no permanent damage and that the pain and swelling subside soon. That must have hurt (and she'll have to explain to everyone who asks what she's done!) Did she not have the catch on? I always make a point of checking before I start winding. Sorry to hear of Chris's close encounter with a windlass. Hope she gets better soon. The boat is what's known as a "blue top". These were among the last boats to be built for carrying freight, and were fitted with (bluish) fibreglass hold covers which could be quickly moved or removed for loading/unloading. There were two "classes" of these boats: river class and admiral class. 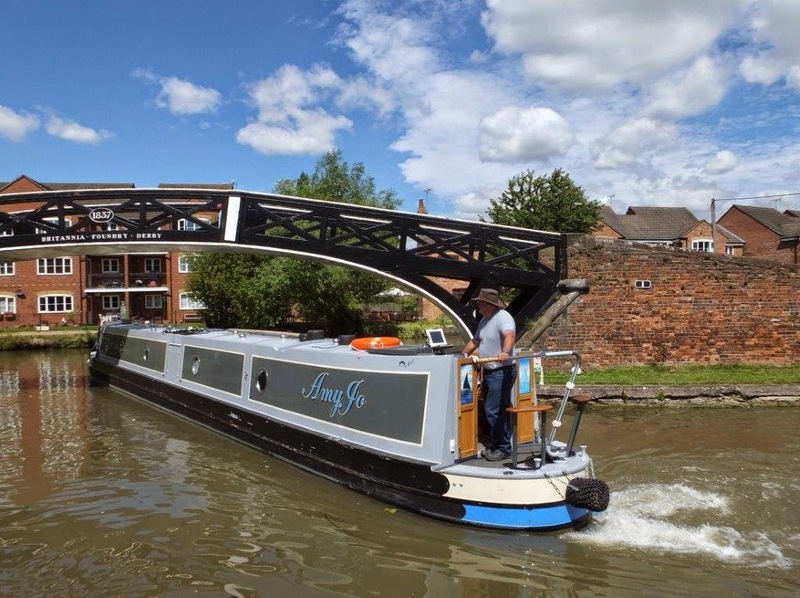 The river class boats were all named after rivers with three letters, e.g. Exe. I sometimes crew for blue top Kew. The admiral class boats were all named after admirals. Collingwood, for example, is usually moored at Gas Street Basin. Thanks Halfie, thought there was something special about these boats. Unfortunately there was no evidence of a name or number on this particular one.